This small batch peanut butter granola is a fun and healthy-ish way to satisfy your sweet tooth. The crispy clusters are light, flaky and completely irresistible – especially with a little melted chocolate on top! 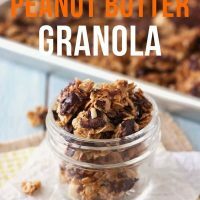 Wildly addictive, this small batch peanut butter granola tastes like a cross between a flaky Butterfinger candy bar and peanut butter oatmeal cookies. Tim took two jars to his office and in less than an hour, ALL of it was gone. And that batch didn’t even have chocolate on it! To Stir or Not to Stir? I’ve always been taught that the trick to granola with lots of clusters is to not stir it while the granola bakes and cools. Curious what happens if you stir a no-stir recipe? We were, so I threw together a batch and baked it for 20 minutes. First, I stirred it after 10 minutes and then every 5 minutes after that. Once the granola was golden and toasty, I pressed it into a single layer in the pan and let it cool. The result: Super flaky granola with zero clumps (like our Small Batch Almond Granola). It tastes great with milk and in yogurt parfaits. My heart will always belongs to clumpy no-stir granola but if you’d like a more cereal-style option, feel free to stir away! 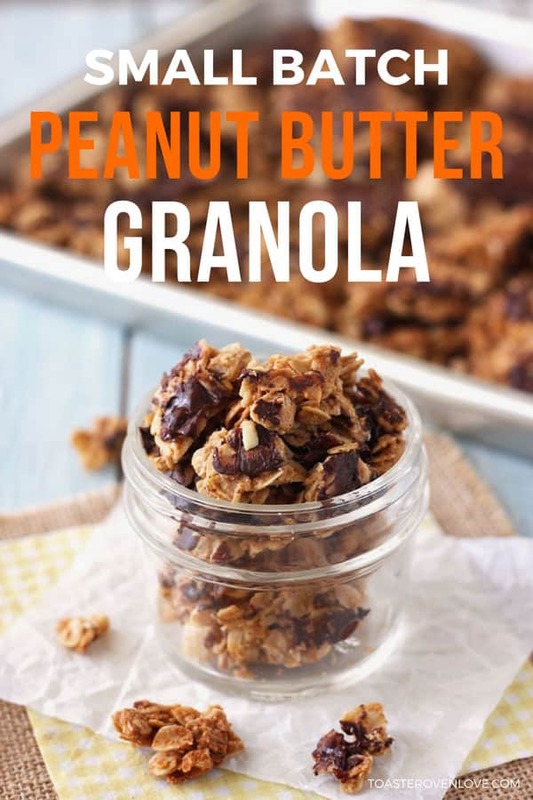 Crispy flaky cluster of peanut butter granola in a small batch recipe that perfect for just one or two people. 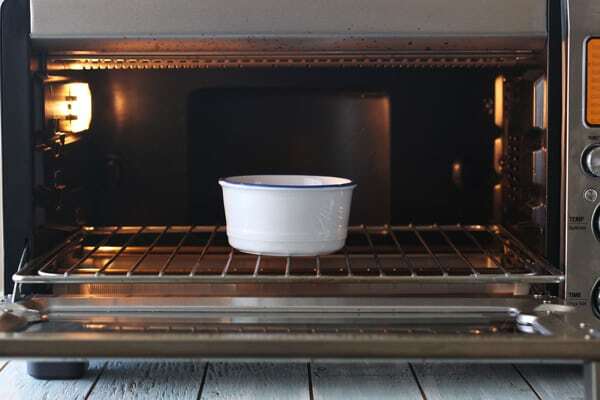 Adjust your toaster oven’s cooking rack to the bottom position and preheat to 325°F. Line the bottom of a quarter sheet pan with a silicone baking mat. 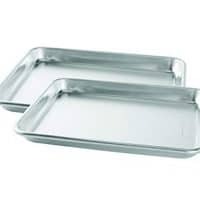 If using a different metal pan, lightly grease the bottom and sides with oil. 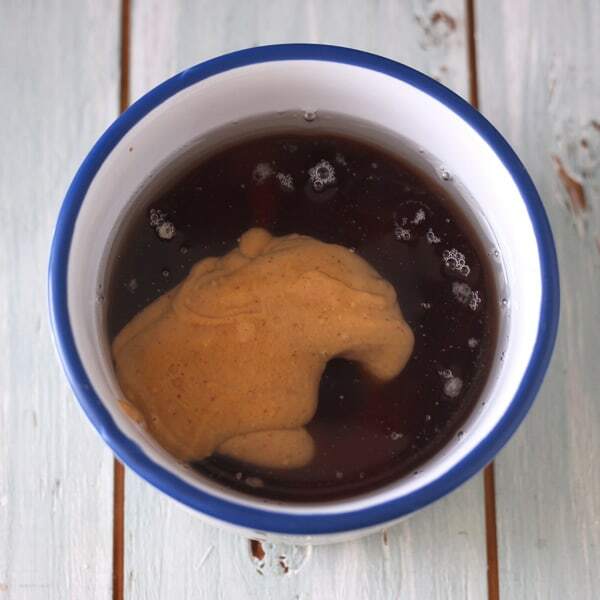 In a microwave-safe bowl combine the oil, peanut butter, maple syrup and brown sugar. Heat in the microwave until warmed and the peanut butter begins to melt, about 20 to 30 seconds. Stir the mixture well to combine and add the vanilla and salt. In a large bowl combine the oats, coconut, and peanuts. Pour peanut butter mixture over oats and nuts, stir well to make sure everything is coated. Pour into the prepared pan. Use a spatula or the bottom of a heavy measuring cup to press and compact the granola into an even layer. Bake at 325°F until the granola is light golden brown all over, about 18 to 22 minutes. While granola is still warm sprinkle with chocolate chips. 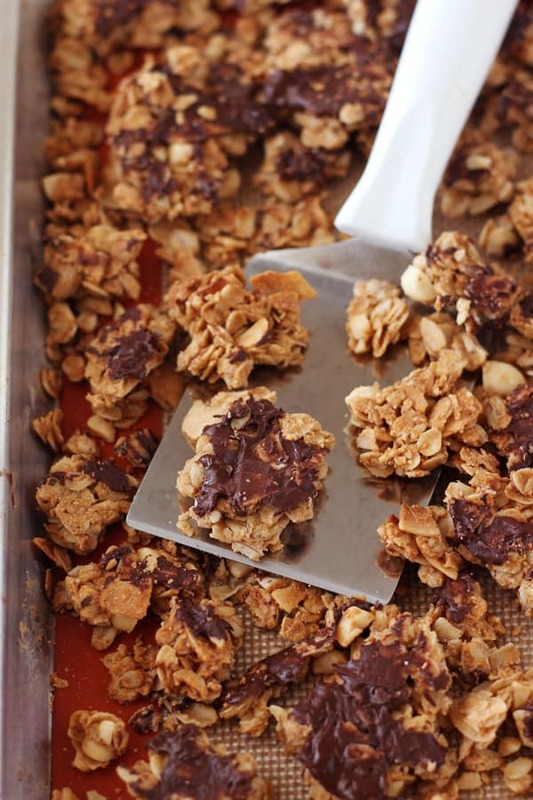 After 1 minutes use an offset spatula to spread the melted chocolate around the top of the granola. 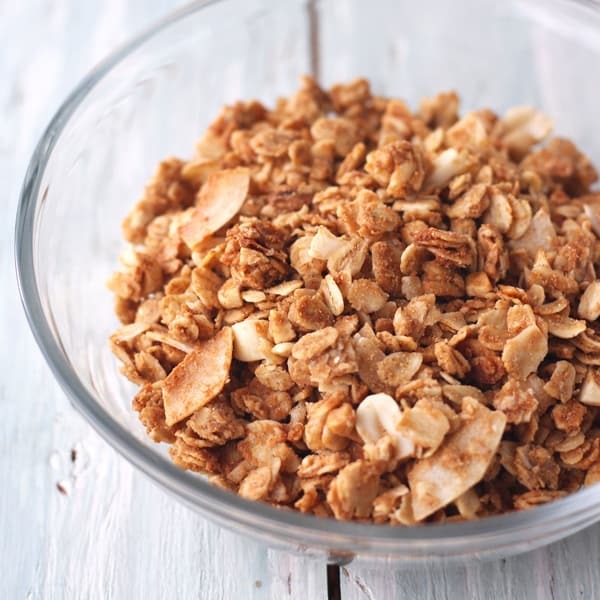 Allow granola to cool in the pan for at least 1 hour, then break into clumps. Store granola in a well-sealed glass jar for 7 days. 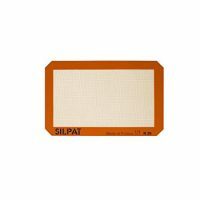 Start by adjusting your toaster oven’s cooking rack to the bottom position and preheating to 325 degrees F.
Line the bottom of a quarter sheet pan with a silicone baking mat. 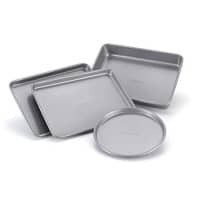 You can also use a metal 8 x 8 pan or 11 x 7 pan. Just lightly grease the bottom and sides with oil. Next, combine the oil, peanut butter, maple syrup, and brown sugar in a toaster oven-safe ramekin. Heat in your preheating toaster oven until warmed and the peanut butter begins to melt about 2 to 3 minutes. Or microwave it for about 20 to 30 seconds. 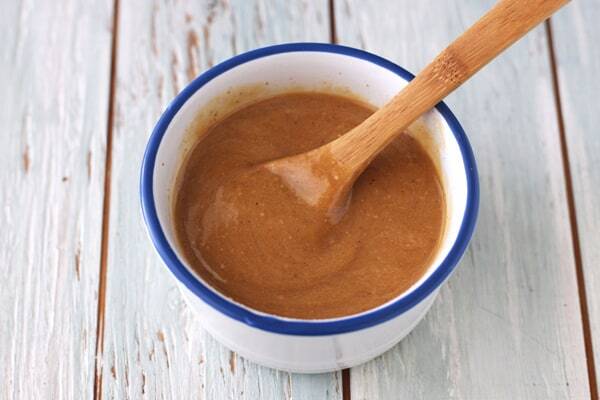 Carefully remove the ramekin and stir the peanut butter mixture until smooth, heating for more time if need. Once the mixture is smooth, add the vanilla and salt. Next, in a large bowl combine the oats, coconut, and peanuts (if using). Pour the peanut butter mixture over the oats and nuts. 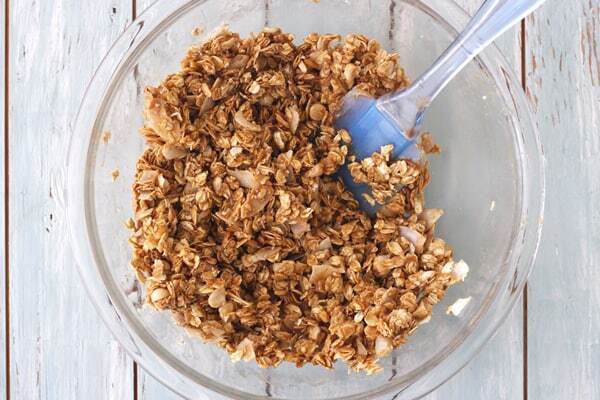 Use a rubber spatula to stir and cut through the bowl to make sure everything (including ALL of the oats) get coated. Pour the granola into the prepared pan. Use the back of your spatula or the bottom of a heavy measuring cup to press and compact the granola into an even layer. Bake at 325 degrees F until the granola is light golden brown all over, about 18 to 22 minutes. If you’re using a quarter sheet pan the granola will be in a thinner layer and bake quicker about 18 to 20 minutes. 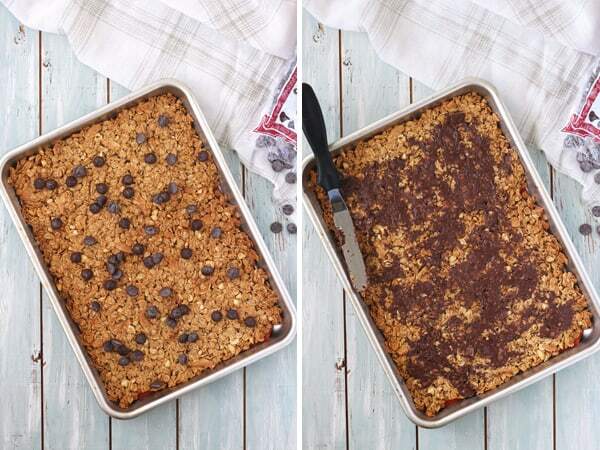 Whenever we bake granola in our 11 x 7-inch pan or 8 x 8-inch pan the granola is in a thicker layer. So it takes longer about 20 to 24 minutes. While the granola is still warm sprinkle with chocolate chips. Let the chips sit undisturbed for about 1 minute to get nice and melty. Then use an offset spatula to spread the melted chocolate on the top of the granola. Allow the granola to cool in the pan for at least 1 hour, then break into clumps. The granola should stay crisp in a well-sealed glass jar for about 7 to 10 days. Though we’ve never made it past day 4 so I can’t say for sure! i make granola often but i’ve never added peanut butter to the mix–delicious idea! This looks so amazing! It definitely looks addictive!